Protein treatments help to improve the appearance of dry, damaged hair. A home protein mask can not only smooth the hair shaft but also provide luster and shine and reduce frizz and flyaways. Protein treatment helps to strengthen the hair shaft and reduces breakage. Protein treatments are suitable for damaged, dry or chemically treated hair. Homemade protein conditioners depend upon several ingredients. However, eggs are the most preferred choice. Generally, eggs are used in combination with yogurt, olive oil, mayonnaise or honey to make a conditioning protein treatment for damaged hair. You should consider various factors when deciding the frequency of using home protein treatment. Extremely dry, curly or chemically damaged hair may greatly benefit from frequent treatments. Bi-weekly protein treatments may be appropriate for chemically relaxed hair, while naturally dry or curly hair may require a protein treatment every two months. 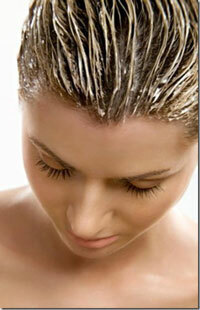 In the case of damaged hair, protein treatments must be used 2-3 times a month. In order to keep your hair soft and shiny, moisturizing treatments must be done on alternating weeks or just after the protein treatment. For healthy hair, protein treatment needs to be done only once a month.